Last week I had to opportunity to get a Specialized Pro Body Geometry Fit done by Mike's Bikes own BG Fit Specialist, Jake Lopacinski. I was pretty excited to get his input and adjustments after changing my entire bike and setup including saddle, cleats and pedals, shoes, bars and stem, and even levers. In order to get rolling I pulled the specs from a previous fit I had done several years ago and adjusted for what felt right. Palo Alto. Mike's uses Time Center which allows you to see when Jake is available and book the time. It also confirms and reminds you of your appointment but also allows you to inform Jake of anything he should know prior to your fit. I expected to walk into the fit studio, kit up, and hop on the trainer but was greeted with the complete opposite. Prior to getting on my bike, taking any measurements, or even changing into my kit, Jake sat me down and asked me a series of questions regarding previous and current injuries, current fitness, and cycling aspirations. The questions were specifically phrased to jog my memory and give Jake important information when fitting me to my bike. For example, in the past year I had a tear in my quadriceps tendon, a tear in my upper quad, and a tear in my rotator cuff but have been focusing on post ride recovery and stretching. Next Jake had me finally change into my kit in order to test my flexibility and take some measurements of my body. He did a series of tests which had my walking, standing, sitting, and on my back raising and dropping my legs. In addition Jake took measurements of my legs and inspected my feet. He informed me that I had excellent flexibility in my lower back which would allow me to achieve a very comfortable yet aerodynamic position on the bike. Jake also discovered that my left leg was 1cm shorter than my right from my hip. Finally it was time for be to get on the bike, but not before Jake took complete measurements of it so that we had record of what we started with. Prior to changing anything I made it clear to Jake that I had achieved saddle bliss with the angle of my Specialized Toupe and didn't want to change the angle on it. After measurements were taken, it was time to warm up. Jake had me spin for a while to get comfortable and into a similar position if I was on the road. During this time he took a short clip of video footage to preserve my previous position and fit. 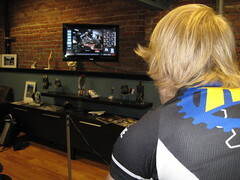 After watching me spin for a while, Jake reviewed the footage and began his adjustments. He first made adjustments to my grey Look cleats in order to compensate for the 1cm difference in leg length. By moving one cleat on my S-Works shoes I would be able to fully extend both legs in my pedals stroke. Next he moved my Toupe saddle slightly back on the on rails. Finally Jake added toe wedges which came with my Moderate (Blue) Specialized BG Footbeds. It's important to note though that after each adjustment was made, Jake had me pedal and give feedback on the changes. Jake (and a few other people) also made comment on how far out my reach was when on the hoods. I am currently running a 120mm stem but he made suggestion to switch to a 110mm stem and a bar with further reach in order to bring my shoulders back a bit when on the hoods but achieve the same position when in the drops. He said that it wasn't required as I currently have no neck or back strain but I am going to give it a try once we place our Zipp Bar and Stem order. Video Analysis Finally came the super cool part of the fitting. Jake took more footage now with the adjustments he made. He then spliced the footage together using the specialized software and drew digital lines on my knees to show the difference in my pedal stroke from the adjustments. It's pretty cool to see the changes and the difference they are making. Follow Up After tweaking and adjusting my bike to the proper fit and reviewing the footage. Jake informed me that I should go out and put some mileage on the new fit and let him know if I have any problems. After changing out my bars and stem I will definitely be stopping by to have them checked. 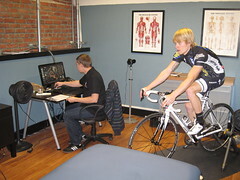 Jake will be performing BG Pro Fits on all Team Mike's Bike riders. I encourage you to ask for feedback or any questions on our fits. More information on the BG Pro Fit process, pricing, and scheduling can be found at the following link on Mike's Bikes website.